I’ll be the first to admit that I wasn’t born with a natural eye for photography. In fact, looking back on my college years working with film, I now cringe at the work I produced. And back then, I had no idea what I was doing wrong, for no other reason than because I had just never been exposed to anything better. My first two years out of college, however, were spent working for the high-end Photography Magazines, Studio Photography & Design (SP&D), Digital Imaging Techniques (DIT) and Photo District News (PDN), where I was exposed to some of the greatest photographers of 2005 and 2006. I drooled over their wedding images, and dreamed about what mine would someday look like, and a funny thing happened… the next time I picked up an SLR (after the digital evolution of course) I was a totally different photographer. I spent years working up to achieving a strong technical level and the types of images I had seen in the magazines I worked for, and I succeeded… but something was still missing. The first time I saw the Fearless Photographers website, I immediately knew I had found a group of photographers who represented everything I wanted to be in my career. The images I saw on their pages took the “candid” photos that I already knew I loved, to a true, individual, storytelling level. 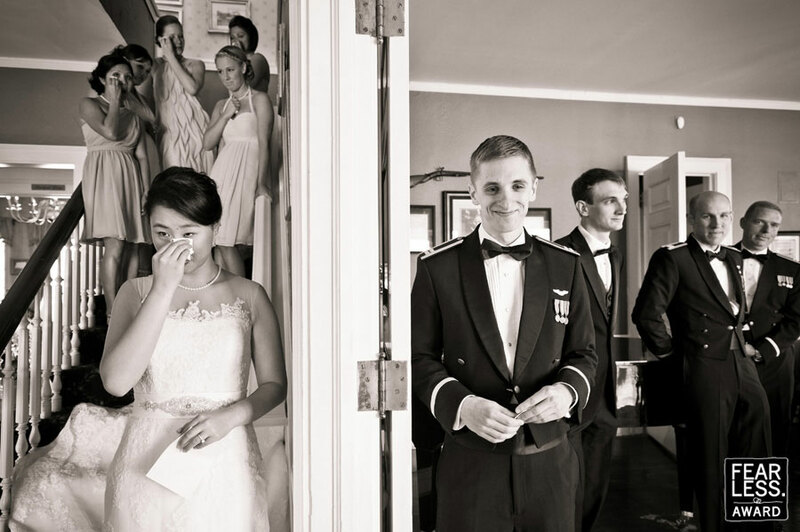 For example, instead of an image of just the bride’s father reacting to seeing his daughter in her wedding dress for the first time (which could have been taken at any point in the wedding) I understood it was better to get the bride’s back in the foreground of that image, so there was no confusion over what was that story was about. One image = One entire story. I also learned that truly great images, are the ones you have to look at for more than a half glance to fully appreciate, because there is so much going on and so much more to the story to see. It was then that I made it my goal to win as many Fearless Awards as possible and become a genuinely “Fearless Photographer.” Awards are granted to the images that best achieve this story telling aspect or are just a blow-your-mind-good picture, and this year we won our very first. I’m so excited to share.